I am so excited about this project today! 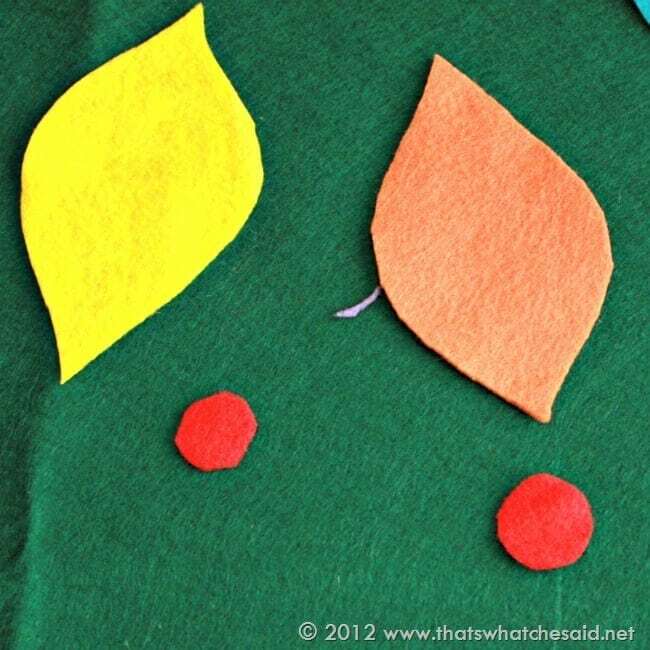 A Children’s Felt Christmas Tree is perfect kid’s Christmas activity for all the small people in your life (and your sanity also!) Give your kids a tree that’s up to them to decorate as they please, hopefully leaving your real tree alone too! EDITED TO ADD: You may now find the patterns and free cut files for this project here! 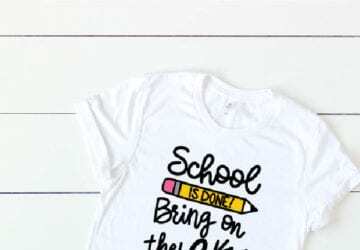 Patterns for tracing and cutting as well as SVG files for use with Cricut and Silhouette Machines! My kids have mostly been pretty good at leaving the ornaments alone on our tree. I put all the keepsake/breakable ones up on top and all of their ornaments and the plastic ones on the bottom! OK back to the felt tree! This project is so easy and really your options for decorations are endless! Use anything you have on hand too! Great for those scraps! hot glue sticks & hot glue gun (Amazon Here) *this is optional. To keep ornament decorations permanent or leave loose to mix and match! First I folded the green felt square in half and used some chalk to draw the shape of a tree. I realized it needed to be much wider to hold ornaments for TWO boys so I made it wider. 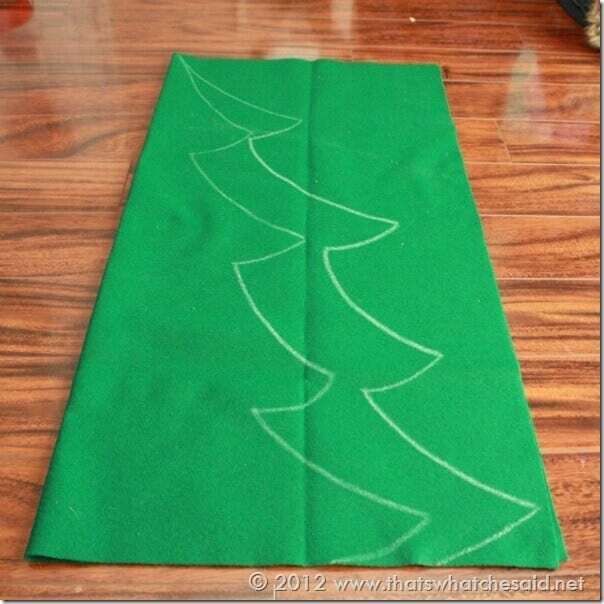 Then simply cut along your pattern lines and unfold to lay flat. Next, I started cutting ornaments. I used a glass to form a circle and then free-handed a star and “pointy ornament” as Michael calls them! You can make shapes also. Get as creative as you want or keep it as simple as you need! 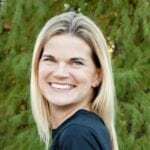 This project is for everyone! I cut a bunch of small circles to use as decorations on the ornaments themselves or as lights on the tree! I also cut some squares and rectangles for presents. I hot glued strips in a plus sign to resemble the ribbon wrapped around a gift and a bow to go on top! Here’s what it looks like put together! 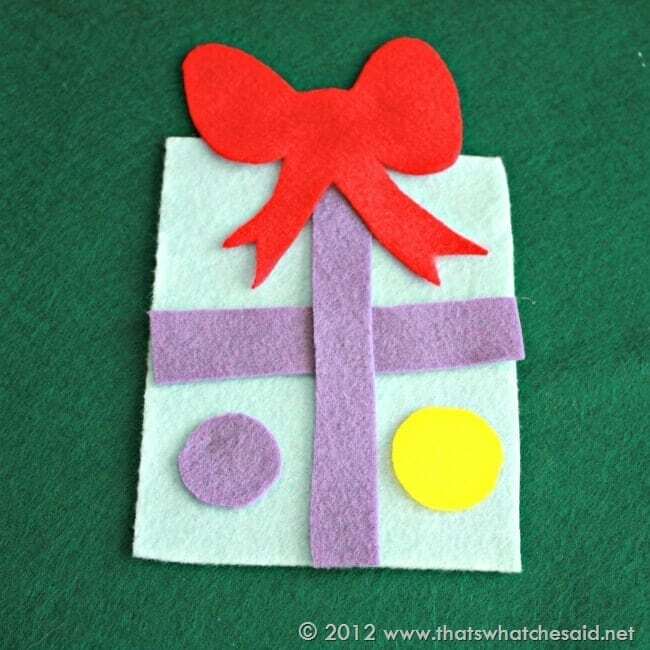 If you keep all your squares and rectangles the same size then you can just make several “ribbon” pieces and they are all interchangeable on the gifts! 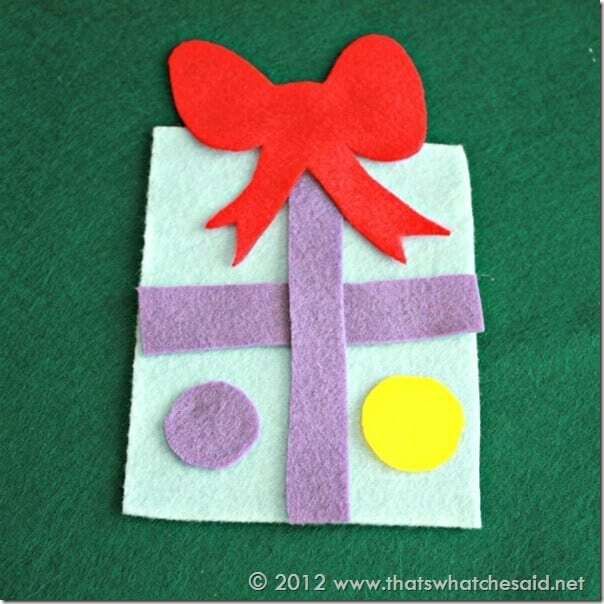 Last but certainly not least…gift tags! 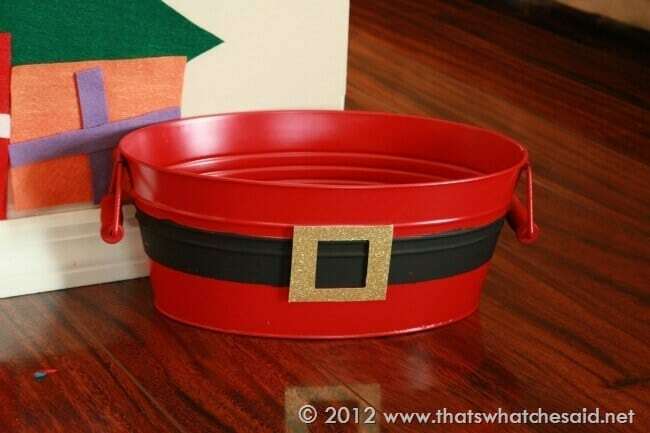 The Santa Bin I made last year as found it’s use for this year! 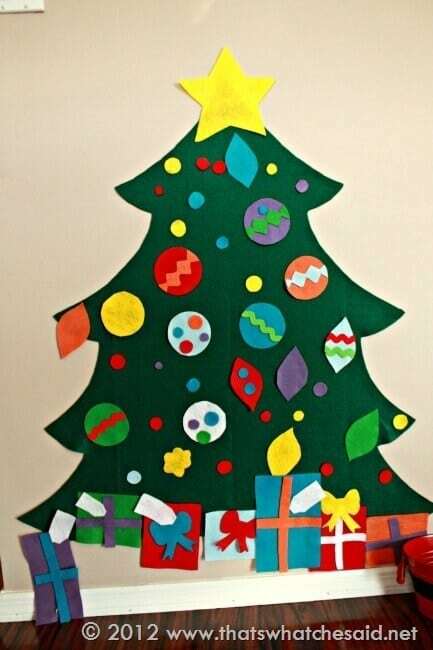 To hold all the felt pieces of the tree! 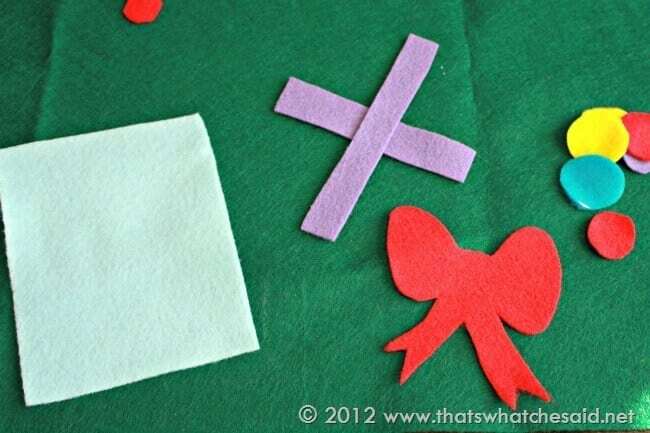 Because as much as my kids love decorating their felt tree…they love un-decorating it even more!! I had felt pieces all over the place! 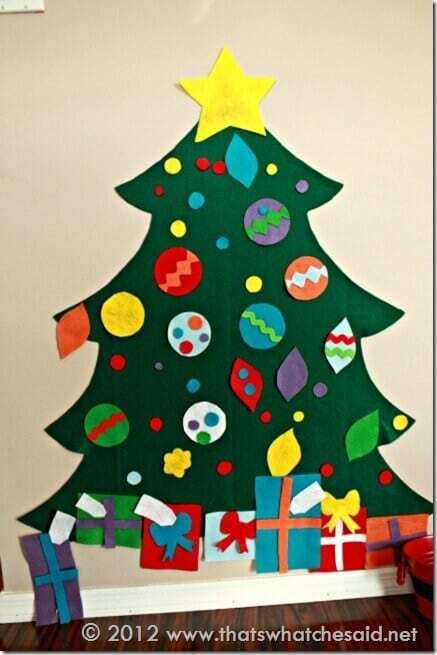 I used some double-sided poster tape to hang the tree on the wall. Then the kids had fun decorating it up. They mix and match and have a great time! Michael used all the gift bows as tree tip decorations and it looked really cute and then he used all the polka dots for the presents! I love their creativity! They also set up their Little People Nativity under their felt tree too! SO CUTE! You can also use this as a great learning opportunity also on colors and shapes, depending on how you cut your ornaments! Never miss an opportunity to let them learn! Want some more Christmas Projects that the kids can get involved with? This ADORABLE Thumbprint String of Christmas Lights Frame is a favorite and also check out all my ornaments as well! Find my Felt Jack-o-Lantern Felt Activity here! 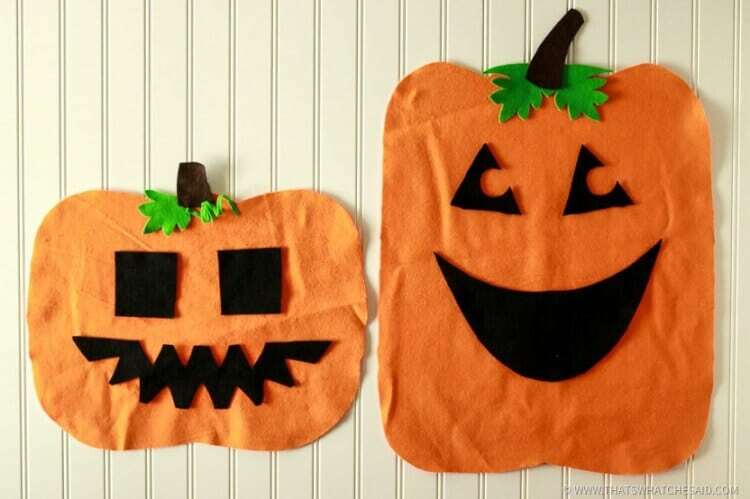 Perfect for Halloween fun! Want more Christmas Posts?! Check out all my 25 Days of Christmas Series in one easy page! Crafts, recipes, gift giving ideas, handmade gifts, gift wrap and so much more! Do they really stick together that well, without falling? I would have thought you glued the decorations to the ornaments…. 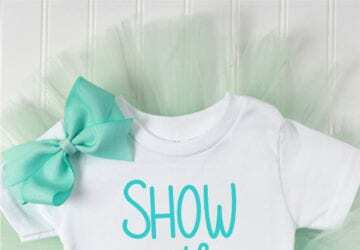 I would love to do this for my daughter… and yours is by far the cutest I’ve seen! Thanks for any feedback! Thanks so much Jeannie! Yes they stick great. It doesn’t take much and they are so light that there is not much to weigh them down! I do like to make sure I use the felt that is kind of “fuzzy” Not the stiff felt that is pretty smooth on the surface! Where do you get the poster tape? It won’t peel paint off the wall? How much and where did you put the tape for mounting on the wall? You can find poster tape anywhere tape is sold pretty much. I have picked it up at Walmart, Office Max as well as my local Dollar Tree! It has not peeled anything off of my walls so far! I just put the tape sporadically around the tree. No particular placements. How many command strips and what size? I used double sided poster tape. 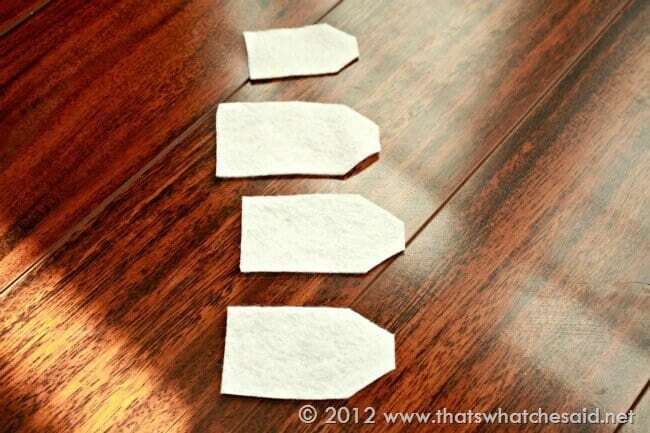 You can use command strips as well. Quantity and size depend on the size of your tree. I would put one at the top and then maybe every other branch? Just enough to keep the tree on the wall as the kids play with it. Love this! I have a special needs granddaughter who loves decorating the tree, so I`m making this for her. I know she’ll love it. Thanks Kim! That will be perfect! I hope she loves it! Carissa it looks great! I love yours! I love this idea!! We don’t have a craft store near me so I will be ordering online. 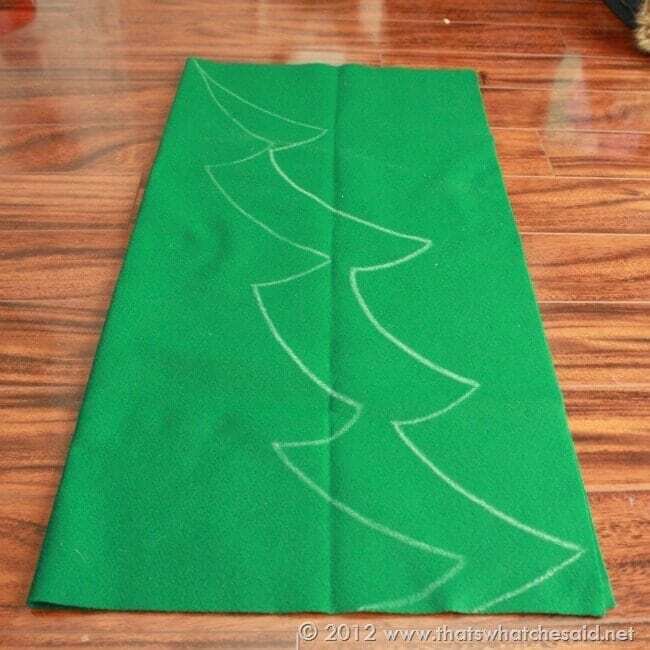 I found a green roll of felt that is 72″ x 1 yd. Is that big enough? 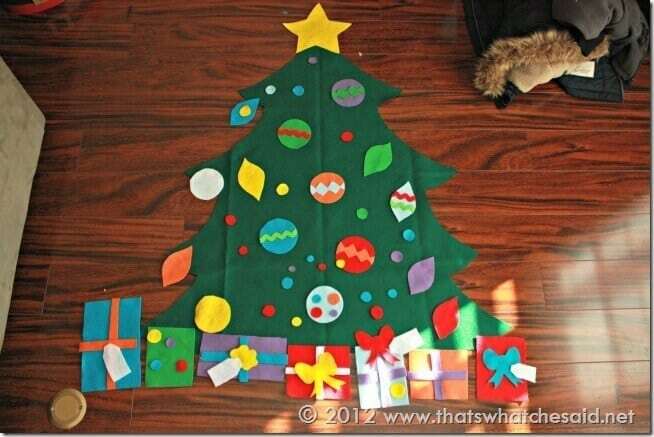 I have also seen a suggestion of gluing the tree to a larger piece of white felt to give more room for presents underneath. Do you suggest that? Thanks Nikki! That roll is plenty! 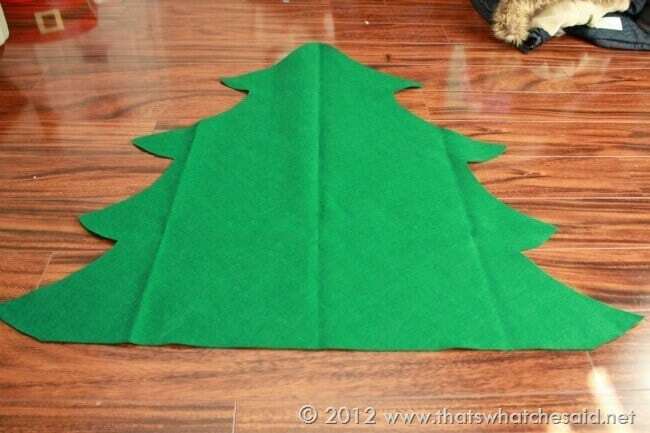 That will make your base of your tree 1 yard wide and that is perfect! My hesitation about adding the white is that it gets heavy and when it gets heavy it gets harder to keep up on the wall. You can always try it and report back! I’d love to see a finished picture too! You can email it to me or share it on my Facebook Page! How thick if the felt? I am trying to make one for Christmas as my son is 13 months. 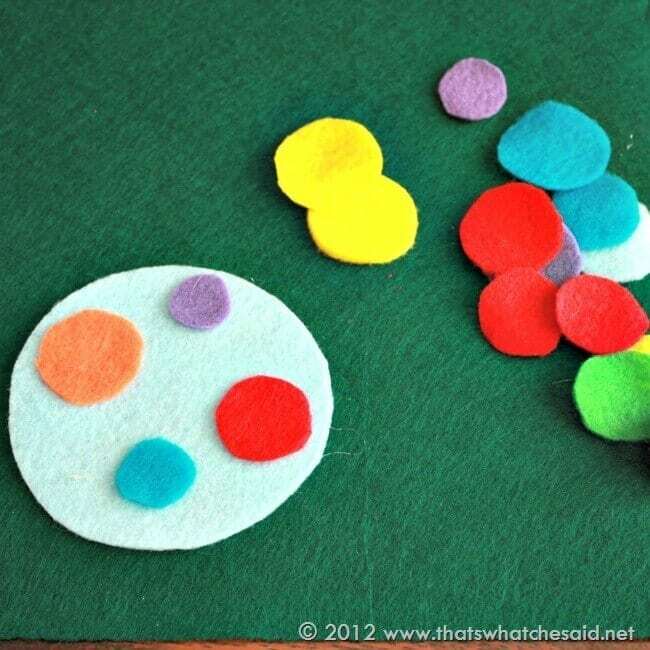 Hi Lydia, Mine is regular craft felt! There is stiff felt and soft and it’s the soft type.